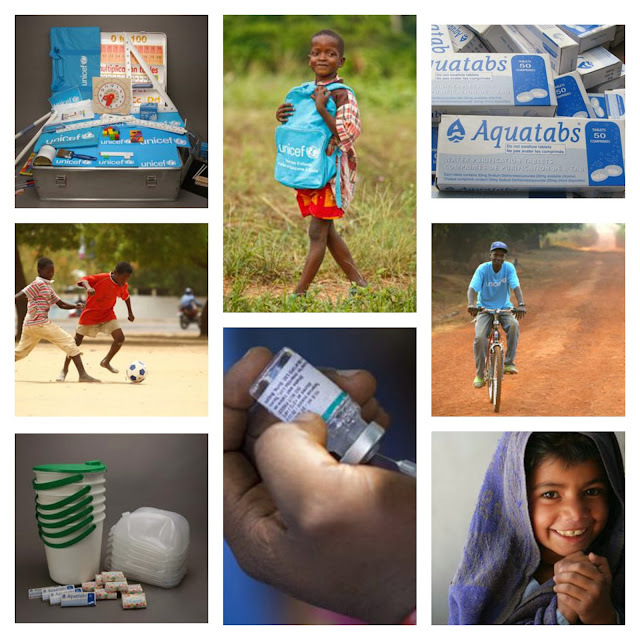 Have you considered UNICEF Inspired Gifts? This gift concept developed by UNICEF helps to provide essential items for survival and development to children in need all over the world. You can choose a gift from different categories: health, water, learn and play, nutrition, emergency, babies… The list of gifts ranges from football for children to play and exercise to vaccination kits to water pump and more. There is a lot of options, all life-saving and life-changing gifts for children around the world. "A UNICEF school-in-a-box will help at least 40 children continue their education in times of emergency and conflict. A school-in-a-box is an innovation in overseas education. Materials for an entire classroom are packed into a large portable aluminium case, including a solar/wind-up radio and even an inflatable globe for geography lessons. The inside lid of the box doubles as a blackboard when coated with the special paint included in the kit. This kit also contains resources for teachers and allows for double-shifts for classes so that more children can benefit." "Help a child get to school every day, or equip a health worker with a sturdy bicycle. When you're a child living six miles from the nearest school, having a bicycle can make the difference between getting to school or missing out on education. UNICEF provides bicycles for school children, from primary school upwards, to enable children living in rural areas to receive education. We also provide bicycles to help health workers and birth attendants reach children and mothers in remote areas. What a practical gift!" Once you have chosen a gift, you customize a gift card describing the purchase. It will then be sent to the person for whom you’re purchasing the gift. And UNICEF will deliver to children in need in any one of 150 countries represented.